The view of our Building from the North side off of Gamble Drive. Note: Please write down this number "just in case" you need directions on the way here: (952) 851-5555. This is the number for the front desk of our floor, Executive Suites of Minnesota - you have the correct number! We are located on the 5th floor of the West End Plaza Building. For your convenience, please use the "West Elevators" and once you reach the 5th floor, get out and Turn Left. Suite 500 is only a short distance away. Thanks! NOTE: It's easiest to park in the WEST parking lot. Take ramp up from Gamble street, to the lot on the side of the building closest to Home Depot & Costco). 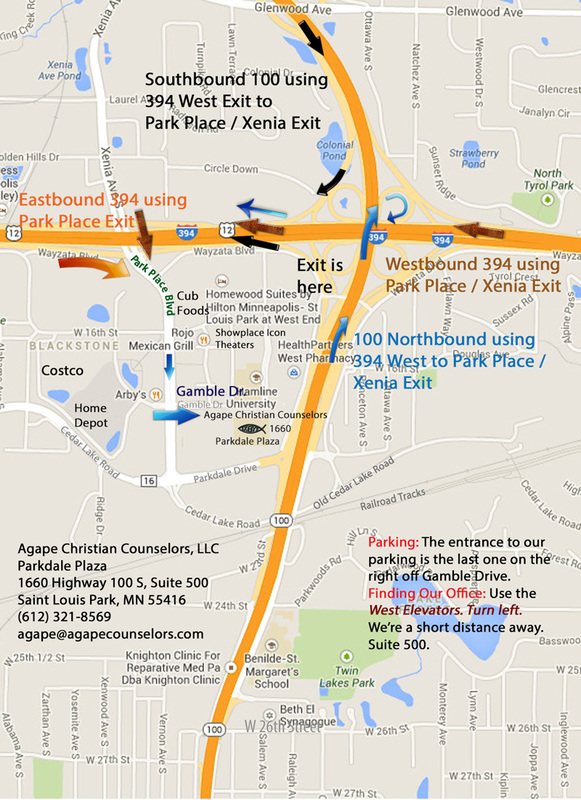 Using our map in addition to Google Maps or your GPS may help you avoid problems. It will also help you find our office once you get in the building. Please print it out "just in case." * You are not a client of Agape Christian Counselors, LLC, until we have both entered into a Client Agreement. * Please note that email and cell phone use are unsecured, but are my chosen methods of communication. If you contact me this way, you are agreeing to the risks associated with the use of electronic transmission of data and voice. When I contact you this way, I do not control the method of transmittal or any service providers and I do not assume any duty, liability, or obligation for the security, receipt, or any third party interception of a transmission.